From family-friendly historical sites and the bustling Inner Harbor, to museums and monuments, Baltimore has a plethora of unique things to see and experience that are not only fun for everyone - they're also free! When you're planning your next visit, be sure to reference these free things to do in Baltimore for inspiration. Experience all that Baltimore has to offer when you stay overnight with one of these amazing Stay & Play hotel offers. 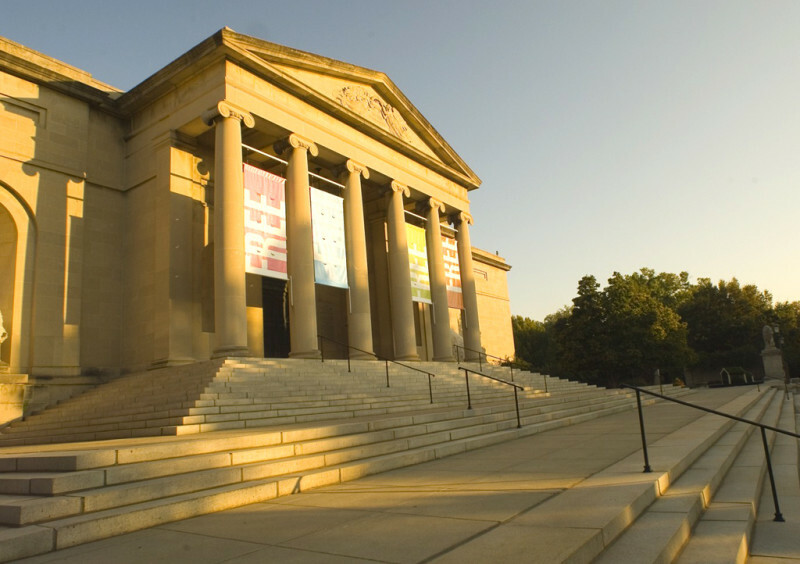 The Baltimore Museum of Art is home to the internationally renowned Cone Collection, and it holds the largest and most significant collection of Henri Matisse's works in the world. Outside the BMA's walls lies the lavish Sculpture Garden, featuring two terraced gardens, fountains and 34 sculptures. Every Sunday the museum hosts hands-on workshops, interactive gallery tours and more activities for families, including the museum’s Family Audio Tour. The tour highlights 20 objects in the collection and is narrated by Raoudi, Matisse’s perky schnauzer. The Walters Art Museum owns more than 25,000 pieces of art and offers free general admission (excluding special exhibits). Bring the whole family to enjoy special family tours and activities for all ages. Children will enjoy the displays of knights' armor, the statues, the colorful paintings, the furniture and the many small and lovely objects – including Fabergé eggs. The museum hosts a variety of free family programs as well, from drop-in art classes on Saturdays and Sundays to museum tours with family-friendly guides. The exterior of the American Visionary Art Museum is almost as interesting as what you'll find inside. The building is surrounded by unique and curious sculptures that you can explore for free and it's open 24/7. Museum admission fees apply for access to indoor galleries. Held annually in July, Artscape, the nation's largest free arts festival, features musical performances by local, regional and national talent on multiple outdoor stages. Enjoy indoor and outdoor visual arts exhibitions, sculptures, art cars, film and theater, crafts, opera, dance, street theater and children's activities. Get in touch with your inner artist by exploring free exhibitions at Baltimore’s School 33 Art Center. The exhibitions showcase the work of artists from the mid-Atlantic region. Edgar Allan Poe and his wife, Virginia Clemm, are buried in the Westminster Hall cemetery. While you're paying your respects to this great American writer, keep a look out for gravestones belonging to other prominent Maryland citizens. More than 60 years old, the Enoch Pratt Free Library continues to enchant book lovers of all ages with its immensity – it spans an entire city block in length. It’s one of the first to be built with an accessible street level entrance. The library’s various neighborhood branches feature free classes, musical performances, children’s story times, special guest speakers and more throughout the year. The Basilica of the National Shrine of the Assumption of the Blessed Virgin Mary was the first metropolitan cathedral built in the United States. This historic site contains neoclassical architecture, a 17th-century organ, stunning artwork and more. Enjoy the free exhibits in all of the galleries on campus at MICA. The Book Thing's mission is to find new homes for books no longer wanted by their owners. Although you're welcome to donate your own books, its not a necessity - you can still browse its offerings and stock up on free reads. Located in Baltimore’s Waverly neighborhood, the store is open only on weekends. The Bromo Seltzer Arts Tower has been transformed into studio space for visual and literary artists. Take part in Open Studio Day to view impressive artwork by talented artists. During this free event, guests can visit artists' studios; view or purchase works of art; and enjoy refreshments and light fare. Spend an evening mingling with artists, sampling cheese and wine and soaking up the arts in Fell's Point. On the first Friday of every month, the Fell's Point Development Corporation works with 13 local galleries to display pieces by local artists. The types of art may include woodworking, photography, sculpture or oil paintings. Restaurants offer specials and stay open late. From depictions of Baltimore sports heroes Johnny Unitas and Babe Ruth to the somber memorial to Holocaust victims, the city has a variety of outdoor monuments to explore. Now you can “meet” your favorite Orioles Hall of Famers. Oriole Park features six larger-than-life bronze statues that capture the likenesses of Frank Robinson, Earl Weaver, Jim Palmer, Eddie Murray, Cal Ripken, Jr. and Brooks Robinson. You’ll find the statues in the centerfield picnic area, but don’t forget to also take a stroll down Eutaw Street to get a look inside the stadium. It’s a fountain you can actually play in! Come down to the Inner Harbor to let the kids cool off on those warm days - all they have to do is stand on the fountain's large, flat surface to catch the spray from its 53 interactive water jets. While your kids play, you can sit back and enjoy people-watching and take in breathtaking views of the Inner Harbor. Join the crew of Baltimore's own pirate ship, Fearless, to hear swashbuckling tales of adventure with Urban Pirates! Climb aboard the ship in historic Fell's Point, where the crew of pirates will take your family back in time without ever leaving the port. Enjoy the captivating tales of pirate history every Friday at 9 a.m. throughout the summer. Climb aboard, tour and learn the fascinating history of any one of the massive ships that visit Baltimore’s Inner Harbor each year. As host to about 24 ships annually, the harbor provides a port for tall ships (large, traditionally-rigged ships) and naval vessels from all over the world, as well as Baltimore’s very own Pride of Baltimore II. Visit www.sailbaltimore.org to view the schedule of incoming ships. Dedicated to Baltimore businessman Pierce John Flannigan III and located near Pier 5 Hotel, Pierce’s Park is much more than just a park. It’s an imaginative space of discovery, where children can interact with locally created sculptures intended for climbing; homonyms engraved along the sidewalk; and even a musical fence. Let the kids play at this sustainable park while you enjoy free wireless Internet access courtesy of the nearby Pier 5 Hotel. Create your next masterpiece at one of the Creative Alliance’s drop-in art classes. Held at the repurposed landmark Patterson Movie Theater, the classes feature kid-friendly art projects and are held every Saturday from noon to 3 p.m. Celebrate the life and legacy of Dr. Martin Luther King, Jr. with Baltimore’s annual parade, featuring floats, high school and community marching bands, and more. The parade kicks off at the intersection of Martin Luther King, Jr. Boulevard and Eutaw Streets. Featuring Irish dancing, a mummer’s band, bagpipes, floats and, of course, St. Patrick himself, Baltimore’s St. Patrick’s Day Parade sets off on its 2.5-mile route at the Washington Monument and ends at Market Street. Join the mayor, local TV and radio personalities and thousands of celebrators as the Mayor’s Christmas Parade works its way through North Baltimore’s Hampden and Medfield neighborhoods. Featuring holiday floats, marching bands and the big man himself, the parade is sure to delight the whole family! Stop by Power Plant Live! on Friday evenings for the Friday Night Live! concert series. Watch local artists and national headlining bands perform on the newest permanent outdoor stage. Head over to Hard Rock Café Baltimore at the Inner Harbor for free outdoor concerts, Thursday through Sunday nights from May through September. Located between the Harborplace Pavilions, the Harborplace Amphitheater hosts free performances by singers, dancers, magicians and more. Street performers entertain by day, while bands of all genres ranging from Motown and funk to R&B and country perform live, free concerts Friday, Saturday and Sunday nights. The Cylburn Arboretum is a nature preserve and city park spanning about 207 acres. Experience the feel of a grand estate in a rolling countryside, all within city limits. Collections of Japanese maples, hollies, conifers, Maryland oaks, tree peonies and magnolias stand on spacious lawns and in luscious gardens surrounding the Victorian mansion. Explore trails that wind through the woodlands, on which you can discover rare trees, native plants and wildflowers. Films on the Pier in Fell's Point features free movies on Wednesday nights beginning at 8:00 p.m. on the Broadway Pier. On Thursdays in July and August at 9 p.m., grab a blanket or a folding chair and catch a free film after dusk on Federal Hill. Flicks from the Hill is sponsored by the American Visionary Art Museum, and admission into the museum is free on these "flicks days" between 5 and 9 p.m. before the film. Get off the road and enjoy a leisurely (or rigorous) bike ride along the recently expanded 15 miles of trails, which follow the Gwynns Falls and finish near the Inner Harbor. A small oasis within the city, Patterson Park offers an opportunity to escape. Sit back and relax by the water at Boat Lake or visit the famed Pagoda (open from April to October) to see great views of the city. You can even take the family dog to the dog park. Leave downtown behind and lose yourself in nearly 750 acres of one of America’s oldest landscaped public parks. 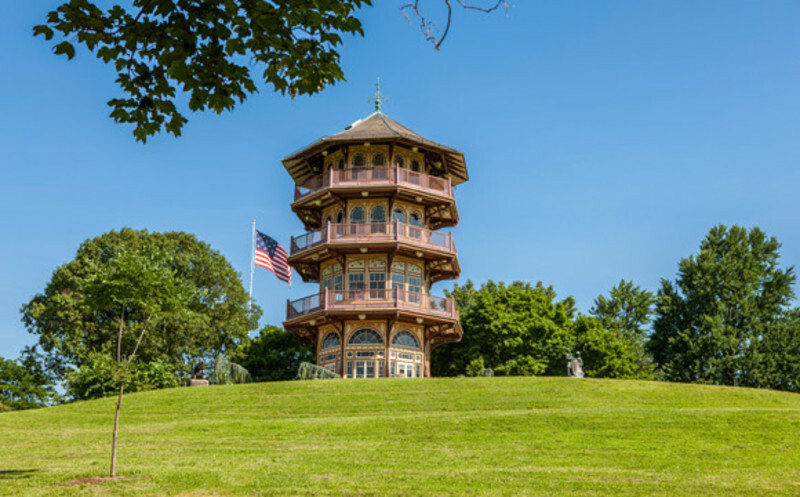 Featured on the National Register of Historic Places, Druid Hill Park boasts miles of trails and green expanses and is home to the Rawlings Conservatory and Botanic Gardens, where you can enjoy the scenery inside, too. Park yourself on a bench atop Federal Hill Park and drink in the sprawling vista of the Inner Harbor. Whether you’re enjoying your lunch on the green expanse or taking your kids to the park’s playground, you’re sure to witness a gorgeous panorama of the city. Once a well-known lookout point during the War of 1812 and the Civil War, the historic park lies on the south side of Baltimore. Where can you find an open-air, rooftop observatory in the middle of the city? Just head to the Maryland Science Center, where every Friday from 5:30-9 p.m. you can stargaze like an astronomer with the help of the center’s 10-foot telescope. Fun fact: The refurbished telescope was built in 1927! Get geared up to throw down on ramps, rails and stairs at the Carroll Park Bike & Skate Park, located just behind the Carroll Park Recreation Center on Bayard Street. The park is open year-round from dawn to dusk. The Mount Vernon Place Conservancy sponsors free community events in the squares every Wednesday night. These events include music, dance and vocal performances and movies shown on a large inflatable screen. Free movies and concerts across Baltimore City parks from April to October. Enjoy nearly 20 minutes of firework bliss at Baltimore’s Inner Harbor during the Ports America Chesapeake Fourth of July Celebration! Enjoy musical performances at the Inner Harbor Amphitheater and free public docking until 11 p.m.
Start the evening with the sweet sounds of live music at the Inner Harbor Amphitheater during Baltimore’s New Year’s Eve Spectacular! Then turn your head to the heavens at the stroke of midnight for the region’s largest fireworks display! And you don’t have to be at the Inner Harbor to enjoy the show — you can watch the display from any downtown neighborhood, from Harbor East and Fell’s Point to Federal Hill. Held annually in August, the African American Festival is a free family celebration of life, music and culture. Attendees can enjoy live music, educational and historical exhibits, an interactive children's area, crafts and more. Enjoy carnival rides, live music and the Fun Fest Flea Market at the Fell’s Point Fun Festival every year in October. With an Arts & Craft Row, Fun Fest Flea Market, six music stages, countless food vendors and carnival rides, the festival provides two days of nonstop fun for all ages! Experience the expanded Fleet Week Festival every other October, filling the Inner Harbor with exhibitors and vendors from maritime, military, cultural and historical organization! Enjoy hands-on activities, local food and drink, musical acts and other entertainment. What started as a small community event has evolved into a neighborhood-wide arts festival that draws visitors and locals to charming West 36th Street. With four blocks of arts and crafts vendors, local merchants, pie-eating contests, children’s activities and live entertainment, Hampdenfest is fun for the whole family. This free connector service operates weekdays along the city's Inner Harbor from 7 a.m. to 7 p.m. It offers free shuttle service to Maritime Park, Tide Point, Canton Waterfront Park, Rusty Scupper (while Harbor View is temporarily closed) and Harbor East. Check out "Baltimore Beach" and its seven volleyball courts made up of 1,000 tons of sand, located at Baltimore's inner harbor. Drop-in and play during the months of March and April for free! A frequent setting in John Waters' films, Hampden still celebrates the bouffant and grilled-cheese charms of Charm City. Come "down to Hampden, hon" for First Fridays when participating merchants stay open late to host events, parties and special sales. Get a real flavor of the "old country," on Stiles Street, as residents and visitors are welcome to partake in a game on the two well-lit sandy courts in the evenings. Click here to find out more. The Charm City Circulator is your fast, friendly, free and green shortcut to Baltimore's hotspots seven days a week. With connections throughout many of Baltimore’s neighborhoods, you can hop from one neighborhood to another quickly and without breaking the bank. Baltimore is full of free things to do thoughout the holiday season. Harbor East’s Window Wonderland kicks off the holidays as local artists dress up the windows of shops and restaurants. Then, take a stroll down 34th Street in Hampden, famous for its annual Miracle on 34th Street light show, when every house on the block displays amazing Christmas lights. Next, head to Power Plant for its Power Plant Light Show Spectacular, complete with a laser light show! Visit Baltimore in October for its city-wide arts extravaganza, Free Fall Baltimore which celebrates creativity. Visitors can enjoy a full month of special events highlighting art, dance and music at lectures, readings and workshops – all offered for free! Enjoy organized events at museums, theaters, city landmarks, parks and trails and much more. For no fee, you can enter Baltimore's Cross Street Market in Federal Hill, Lexington Market near the Hippodrome Theatre and the Broadway Market in Fell's Point. Get a feel for what doing the food shopping used to be like as you watch butchers and fishmongers at work and smell wonderful food cooking. The Baltimore Farmers' Market offers the best deals on produce, herbs, flowers, fruit and more. The market, located underneath the Jones Falls Expressway at Holliday and Saratoga streets, is open daily from early April to late December. This market is the largest producers-only market in Maryland. If you're lucky, you might just get some free samples! And while you’re at it, check out the Fell’s Point Farmer’s Market on Saturdays in season, located on the waterfront at Fell’s Point’s Broadway Square. Or, head to the Baltimore Museum of Industry Farmer’s Market, where you can find everything from ice cream to fresh-cut flowers, as well as enjoy free parking! Who will be crowned the Grand East Coast National Mediocre Champion? Each May, head to the American Visionary Art Museum for its annual Kinetic Sculpture Race, where you can cheer on racers piloting custom-built kinetic sculptures over land, mud and water. Arrive between 9 and 9:30 a.m. for the opening ceremony and the “Blessing of De Feet,” then follow the race over its 15-mile course or camp out at any number of checkpoints, such as the uphill mud pit or not-so-quick sand pit in Patterson Park. Because the Baltimore Tattoo Museum focuses on electric tattooing in America, you'll see examples of traditional American and traditional Japanese tattoo artwork, black and grey work, portraits, photo-realism, flash designs and complete custom-drawn designs. And if you like something you see, the museum is also a fully functioning tattoo studio. Hundreds of “hons.” That’s what you’ll find at Baltimore’s very own Honfest, a four-block-wide festival in Hampden where you can get your own beehive hairdo, enter a mashed potato contest and see who’s crowned Baltimore’s “Best Hon.” Celebrating the Baltimorean word “hon,” a term of endearment short for “honey,” Honfest is held every year in June. Step back in time at one of the nation’s oldest surviving big-city railroad terminals. 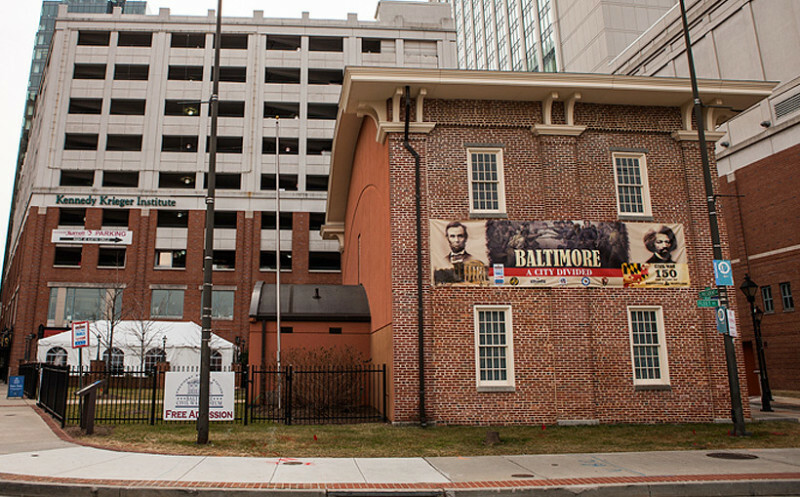 President Street Station, once an important rail connection during the Civil War, now houses the Civil War Museum and its permanent exhibition focused on Baltimore during the Civil War. The museum also features exhibits focused on Maryland’s railroad history and President Street Station’s own role in the transportation of slaves escaping to the North. A tribute to former president George Washington, the Washington Monument is the centerpiece of Mount Vernon Place. Visitors can take virtual tours of the monument for free in the gallery. Admission applies to climb to the top of the tower. There are no related profiles to display.